The Ideal 3803 and 3803CC Shredders for continuous use in the Large Office featuring an Illuminated Multifunctional ‘EASY SWITCH’ with many advanced features. Automatic Start/Stop by Photo Cell when paper is offered to the extra wide 380mm Entry Throat designed for destroying wide format paper like computer printouts. Auto Reverse in case of paper jams. Auto Stop when the collection waste bin requires emptying and when the waste cabinet door is opened. All 3803 and 3803CC models have a high quality tall, fully mobile cabinet which accommodate high capacity 160 litre waste collection bags on a sliding frame. 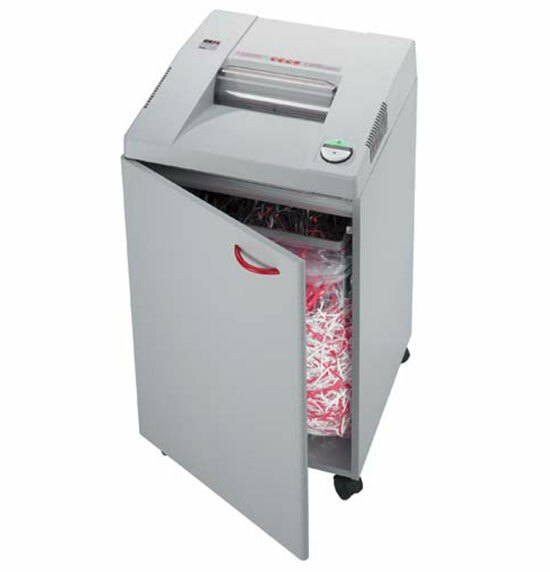 Shred up to 3 reams of paper before the shredder will require emptying.